Investigators say a former top Justice Department official made false statements to Congress and violated federal law in hiring for the department's civil rights division by discriminating against those he believed were not conservative enough. The accusations are included in a new report by the Justice Department's Inspector General on Bradley Schlozman, the former acting head of the civil rights division. The report says Schlozman politicized the hiring of attorneys positions, mistreated his staff and tried to punish agency employees he believed were too liberal. The report cited an e-mail in which Schlozman noted it had been a while since he'd had to "scream with a bloodcurdling cry at some commie, partisan subordinate." The report, "An Investigation of Allegations of Politicized Hiring and Other Improper Personnel Actions in the Civil Rights Division," was dated July 2 of last year but released today. Although investigators had referred the case to federal prosecutors last spring, they decided last week not to file charges against Schlozman. Tuesday's report by Inspector General Glenn Fine found that Schlozman (who served in the Civil Rights Division between 2003 and 2006) "inappropriately considered political and ideological affiliations in hiring career attorneys and in other personnel actions affecting career attorneys in the Division. "We concluded that in doing so Schlozman violated federal law (the Civil Service Reform Act) and Department policy, both of which prohibit discrimination in federal employment based on political or ideological affiliations, and committed misconduct," the report stated. The investigation, conducted with the agency's Office of Professional Responsibility, also found that Schlozman did not tell the truth to Congress when he told Sen. Charles Schumer, D-N.Y., in a June 2007 hearing that he did not consider political affiliations in hiring. This is the most recent of several reports that found senior Justice Department officials had violated civil service laws under the tenure of former Attorney General Alberto Gonzales. The political controversies - in particular the firing of nine U.S. attorneys - led to Gonzales' resignation in 2007 amid charges that White House officials under President George W. Bush had influenced decisions at the normally independent Justice Department. The report describes how, one year into the Bush administration, the standard hiring practices at the Civil Rights Division were changed. In prior years, the managers of each of the division's eight major sections would select and interview applicants for attorney positions and pass their final recommendations to the front office for approval. Section chiefs interviewed for the report could not recall any instance in prior years where their recommendation was not OK'd. In February 2002 the hiring process was changed. According to a memo from Ralph F. Boyd, Jr. (who was Assistant Attorney General from July 2001 to July 2003), the posting of open attorney positions, as well as all applicant and interview decisions, would be passed down by Human Resources and the Deputy Assistant Attorney Generals (DAAGs) to section chiefs, with a final decision made by the Assistant Attorney General. Section chiefs would have input but could only make a recommendation for hiring, as did the DAAGs. The goal of the changes, according to the memo, was to centralize the recruitment and selection process. Boyd told investigators that he instituted the changes to improve diversity and to increase the consideration of applicants with educational and work backgrounds that were "less traditional" than those typically hired. While broadening the law schools whose alumni were being considered, the changes also narrowed the scope of those making the decisions. In 2003 Schlozman (then a Deputy Assistant Attorney General in Civil Rights) was authorized to handle most all of the Division's hiring in five sections (Special Litigation, Employment Litigation, Voting, Criminal and Appellate), a responsibility for which he was said to have shown great interest. After a December 2003 memo further narrowed hiring procedures, limiting the ability of section chiefs to access information from Human Resources - even preventing them from obtaining copies of attorneys' applications - Schlozman exercised even more control by exclusively screening resumes and conducting interviews. When one section chief [whom Schlozman prevented from asking questions during job interviews] asked for more input, Schlozman wrote, "My position is that long-term hires are the prerogative of the leadership." By contrast, the chiefs of three Division sections which were not supervised by Schlozman (Educational Opportunities, Housing and Civil Enforcement, and Disability Rights) reported that their hiring of experienced attorneys was not affected by political or ideological considerations. "A Member Of The Team"
The report's writers examined approximately 200,000 e-mails from the period in question, acknowledging that it was a fraction of communications sent, but that "[b]ecause of the Department's procedure for backing up and preserving e-mails, some e-mails were not recoverable." One example, dated January 6, 2004, was in response to a recent hire who noted with happiness that his office was next to that of a "Federalist Society member." Schlozman wrote, "Just between you and me, we hired another member of 'the team' yesterday. And still another ideological comrade will be starting in one month. So we are making progress." One official reported that Schlozman expressed pleasure about his bringing "RTAs" (meaning "right-thinking Americans") and Republicans into the Division, adding, "[He] liked hiring conservatives." Schlozman evidently made no secret of his agenda in personnel matters. Andrew Lelling, a former counsel to Boyd, told investigators that Schlozman "was always very unapologetically clear about the kind of people he wanted hired into the Department. ... [H]e want[ed] people in the Department who [were] conservative on the legal issues, maybe conservative period." In e-mails Schlozman would make frequent use of descriptions like "real American," "right-thinking American," "fine young [A]mericans," and being "a member of the team" to refer to conservative applicants and attorneys. Conversely, applicants or attorneys who were viewed as not conservative would be described as "commies," "libs," "pinkos," "not one of us," "not on the team," and "adherents of Mao's little red book." He said one attorney was "a Democrat in hiding and is not going to hide in my Appellate Section." In a July 17, 2006 e-mail to Monica Goodling, then Senior Counsel to the Attorney General and White House Liaison, he described himself as part of a "four-member Vast Right-Wing Conspiracy at my former law firm." In a January 12, 2004 e-mail to a Division front office Counsel about an attorney being referred for a career civil service position, Schlozman asked, "How does he view the world, if you know what I mean?" adding, "(and for God's sake, don't forward this email!)" "[W]hen we start asking about, "what is your commitment to civil rights?" . ... [H]ow do you prove that? Usually by membership in some crazy liberal organization or by some participation in some crazy cause. ... Look, look at my résumé - I didn't have any demonstrated commitment, but I care about the issues. So, I mean, I just want to make sure we don't start confining ourselves to, you know, politburo members because they happen to be a member of some, you know, psychopathic left-wing organization designed to overthrow the government." Schlozman overruled Cutlar's objections about hires, including one woman who made false statements on her application and was unqualified. Schlozman told Cutlar to "let it go" - the woman was a member of the Federalist Society and the Republican National Lawyers Association, as well as the girlfriend of an attorney in the Educational Opportunities Section. Another official said Schlozman's choices for career civil rights positions rarely had any civil rights or federal criminal experience, and rarely expressed any interest in civil rights enforcement. In another e-mail, Schlozman wrote on July 16, 2003, "My tentative plans are to gerrymander all of those crazy libs rights out of the section." While Employment Litigation Section Chief David Palmer told investigators he did not agree that there was an agenda to hire strict conservatives in the department, he did feel that Schlozman wanted to hire people he felt would not leak information to the media. Schlozman's influence also extended to the Attorney General's Honors Program, which hired recent law school graduates and judicial law clerks, and the Summer Law Intern Program. Investigators discovered that while political or ideological influences had not affected the programs before or after Schlozman's tenure, it was a very different picture during the time he was, as one official called him, "the point person." "Okay, but just remember, Republican judges are generally far more demanding of quality, accuracy, and faithful adherence to statute and constitutional text than liberals, for whom activism and advocacy are the hallmarks of acceptability." The results of Schlozman's hiring practices are evident in the numbers. Comparing the political and ideological affiliations of Civil Rights Division Attorneys hired between 2003 and 2006, a distinct difference can be seen between those hired by Schlozman in the five sections he oversaw and those hired in the three sections over which he had no input. Of Schlozman's 99 hires, 64% were Republican or conservative, 2% were Democratic or liberal, and 34% were unknown. Of the 13 non-Schlozman hires, 31% were Republican or conservative, 23% were Democratic or liberal, and 46% were unknown. "I Felt The Need To Scream ... At Some Commie, Partisan Subordinate"
In 2006 Gonzales appointed Schlozman as interim U.S. Attorney for the Western District of Missouri, filling the position previously held by Todd Graves, despite Schlozman's lack of experience as a prosecutor. Graves was one of nine U.S attorneys forced out at Justice. "It has been months since I felt the need to scream with a blood-curdling cry at some commie, partisan subordinate (i.e., most of the [Voting] section staff until recently). And I feel like the people I now work with are all complete professionals. What a weird change. Granted, these changes are nice in many respects, but bitchslapping a bunch of [Division] attorneys really did get the blood pumping and was even enjoyable once in a while. I think now it's all Good Cop for folks there. I much preferred the role of Bad Cop. ... But perhaps the Division will name an award for me or something. How about the Brad Schlozman Award for Most Effectively Breaking the Will of Liberal Partisan Bureaucrats. I would be happy to come back for the awards ceremony." 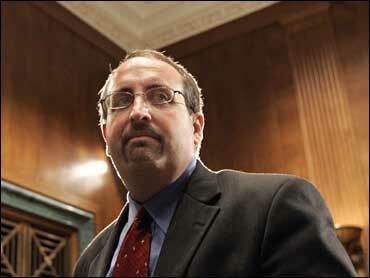 In March 2007, Schlozman returned to Washington to work at the Executive Office for United States Attorneys (EOUSA). During a visit to Cutlar's office, during which they discussed the allegations of partisan hiring at the Division which were being reported at the time, Schlozman said to Curlar that, "You know, I was thinking I probably made some mistakes . ... I probably considered politics when I shouldn't have." Cutlar stated that Schlozman claimed, "I'm just saying I got caught up in the group mentality. You know how it is." However, Cutler said that Schlozman later backtracked from such sentiments, telling her in a phone conversation, "You know I didn't do anything wrong." Senator Charles Schumer: Mr. Schlozman, is the policy against considering political and ideological affiliations in the hiring of career department employees formal or informal? Mr. Schlozman: I think it is pursuant to a civil service statute for career employees -- the Hatch Act. Senator Schumer: Yeah. Did you ever violate it? Mr. Schlozman: I did not. Senator Schumer: Did you ever, quote, "cross the line," as Ms. Goodling has admitted doing? Schlozman resigned from Justice in 2007, and currently practices in the Wichita, Kansas law firm of Hinkle Elkouri in the areas of employee benefits, taxation, and tax litigation. Today's report also faults the managers above Schlozman who, they said, received warning signs of inappropriate conduct but did not stop him or rein him in. Citing the "troubling conduct" described in the report, Justice Department spokesman Peter Carr said the agency has since reformed its hiring practices. "We are confident that the institutional problems identified in today's report no longer exist and will not recur," Carr said. Schlozman's lawyer, William Jordan, denied the allegations, saying his client had passed a lie-detector test. "The report released today is inaccurate, incomplete, biased, unsupported by the law, and contrary to the facts," said Jordan, who accused the investigators themselves of "extraordinary bias and lack of ethical and legal standards."